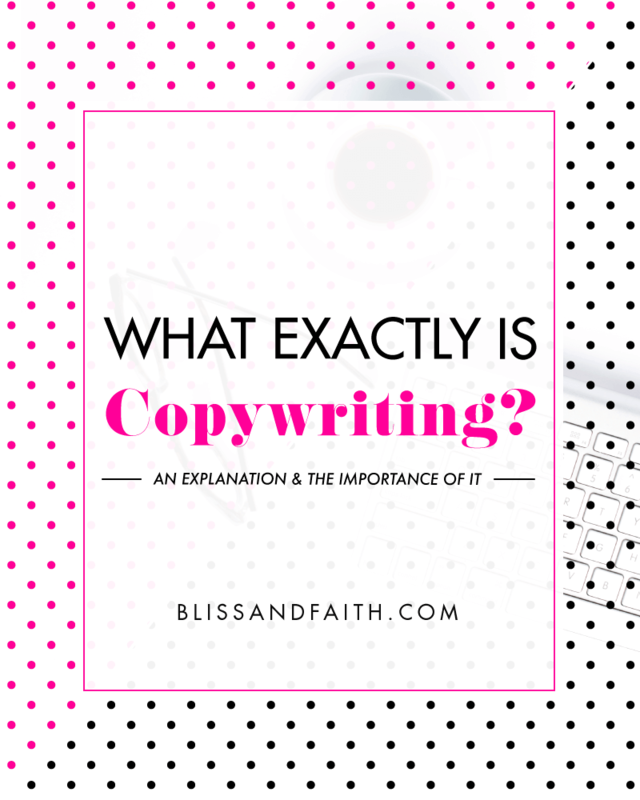 You may have been seeing the term copy or copywriting buzzing about lately and wondered exactly what it was. Up until my rebrand in March, I wondered the same thing, so don’t feel too out of the loop! It was the first time I’d even heard of the term, much less understood what it meant and how it’s used. Well, I’m serving up for you today, an explanation of it and the importance of it. 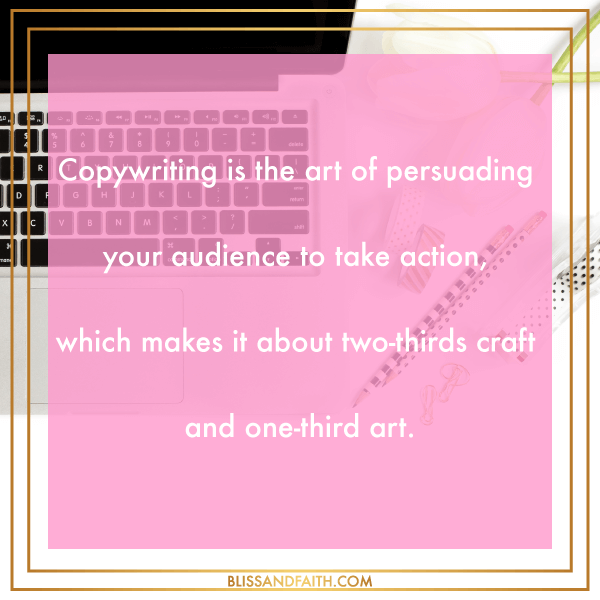 As I began to research what copywriting was, I was introduced to an entirely new niche of creative experts that I never knew existed. These individuals are the one’s responsible for transferring simple words into compelling language. This compelling language is what resonates with you and makes you feel as if you can relate to someone when you visit their site, more specifically their about or services pages. If you’re thinking about offering products or services, you definitely want to ensure you have good copy, because without it you risk your target customers or clients not fully understanding what you offer. Copywriting 101: Learn the 4 key elements here. In addition to your copy containing those four crucial elements, its needs to be structured to be persuasive. For starters, it needs to be clear, concise, and simple. You don’t want your copy to be over complicated or hard to understand. It should speak directly to your target audience and resonate with them easily. They should walk away feeling engaged and motivated to come through on whatever call-to-action you have put out there. Copy needs to be clear, concise, and simple. I have been through countless versions of what I thought was effective copy here on Bliss & Faith, only to realize that none of it was resonating with my target audience. It lacked strategy and structure, and therefore no one engaged it. Copy is never set in stone, but you should strive to make it as effective as possible so that it can actually convert. If your copy isn’t converting, you need new copy. I realized this a few days ago when I went back through the copy on my home page and about page and came to the conclusion that it was entirely too convoluted. As specific as I’d tried to make it, it was still too broad and speaking to far too many. Much less, it wasn’t letting visitors clearly know the purpose and why of Bliss & Faith. It’s still a work in progress, because I’m not a professional copywriter, however in writing my new copy I followed a set of guidelines that I had not previously done. Number five is the one that I focused on the most, because one of the major focuses for my business and blog is to teach, which is how I show benefit. Copy serves to show people the benefit of a particular call-to-action, product, or service. I needed my copy to show the benefit of what I offer versus only the features of it. Copy serves to show people the benefit of a particular call-to-action. The features don’t tell potential clients or customers enough, they don’t reach them on an emotional level like conveying the benefit of an action does. It’s one of the hardest things about copywriting to me because it’s much easier to list out the features of something, rather than trying to emotionally connect with an audience. This is one reason why it’s so important to really know your target client or customer. They are who you’re actually writing copy to. 6. Show them that your efforts are genuine. One thing to keep in mind when it comes to writing copy is that it takes time to measure, improve, and track. It is more of an art, rather than a science, so testing it out is a must! If you’re not testing your copy or paying attention to the fact that it’s not converting, this in and of itself is your first mistake in not having a profitable business. As entrepreneurs, we must always be paying attention to what works and isn’t working when it comes to our businesses. Copy takes time to measure, improve, and track copy. As much as I wanted my previous copy to work (because I liked what it said so much), it wasn’t converting and at the least garnering any real interest. The fact that it wasn’t converting meant I wasn’t making any money, hence my business not being profitable. When we don’t have a profitable business, we aren’t motivated to keep them going. We pretty just have an expensive, time-consuming hobby at that point. I had one of two choices to make: shut everything down or so some examination and rewrite my copy. I chose the latter because I’m so passionate about teaching fellow creatives how to run their business better, as well as blog better for them. If you find yourself in a similar scenario, don’t give up! Take a step back to examine who you are really talking to and what you’re saying. Does it speak to them? Evoke an emotion response? Make them an offer they can’t refuse? If it’s not doing at least those three things, then it’s probably a good idea to get some new copy. If you don’t feel like you can effectively write your own copy, you can always hire a copywriter. They can be quite an investment, but once you’re making the money in your business that you dream of making, it will make it well worth it. At the end of the day, you should simply speak to your reader as if you’ve been where they’re at, naturally and authentically. If you can let them know that you understand and can empathize the place they’re in and help them get out of it, you’re golden. Copywriting is about remembering that people are human and that you’re not a commercial. It’s not salesy or scammy, because you’re providing a valuable product or service that will make their dreams come true or help them achieve their goals and aspirations. What Exactly Is Copywriting? Learn all about it here! Listen to more about this topic on the Branded Bliss Podcast! So tell me! – What do you think of the copy on your site? Does it compellingly speak to your audience?